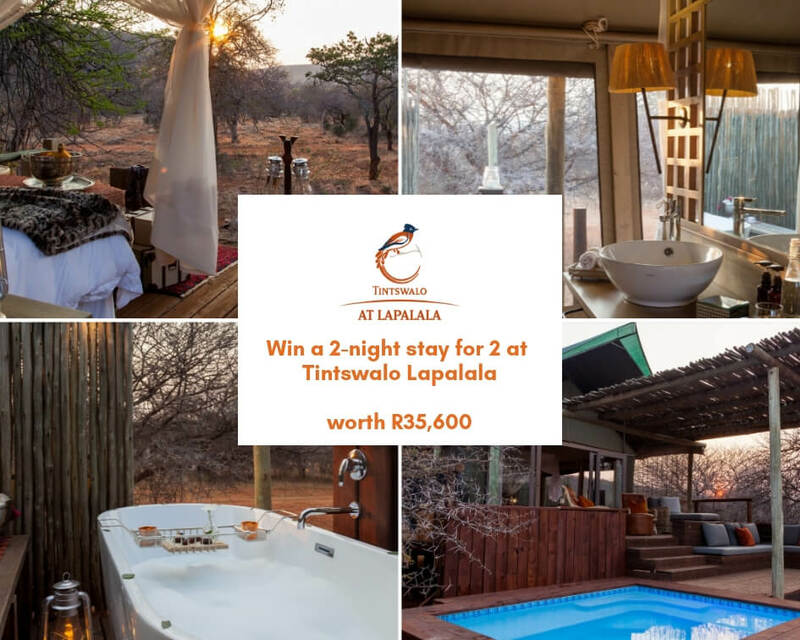 One lucky Travel Ideas reader will win a 2-night stay for 2 sharing at Tintswalo Lapalala, inclusive of all meals, all house beverages and two safari activities per day, valued at R35,600! Situated in the malaria-free Waterberg (Limpopo Province), Tintswalo Lapalala Wilderness is a family-friendly lodge of seven luxury tented suites with private plunge pools, including a two-bedroom family tented suite, to accommodate a total of 16 adults and 4 children. Environmentally conscious, it is operated off the grid, presenting a sustainable wilderness and safari experience with the expansive 44,500-hectare reserve. The Sheer expanse of the game-rich reserve offers seclusion and a multitude of unique wilderness experiences for the whole family, including daily game drives and guided bush walks, and a Children's Activity programme. Excursions are offered to the Wildlife Breeding programmes and the community-based Lapalala Wilderness School, as well as to an iron age site to view ancient artefacts and Bushmen rock paintings. With 27km of pristine river frontage throughout the reserve, the Palala River presents the unique opportunity to fish the crystalline mountain waters or swim in the bubbling rapids. More relaxing pursuits include sundowner cruises and riverside picnics, birdwatching, stargazing and spa treatments, while those with an adventurous spirit may opt for a romantic sleep-out experience under the African skies in a remote part of the reserve to bring luxury as close to nature as can be imagined. Answer the following question: Which province is Tintswalo Lapalala Wilderness located in? Complete the entry form below ensuring that you provide your answer, name, surname and daytime contact number. Competition ends 31 March 2019. Winners will be selected from social media and email entries, announced on social media and contacted telephonically. T&C's apply. Enter this competition via email by completing the competition entry form below!